The Terlep newlywed suite is… well on the small side. We have been creative with our storage in our one bedroom apartment, and have tired to limit those things we don’t need right now. We are lucky to have a washer and dryer in the unit. I know many one bedroom places do not. However, like our apartment, the machines are tiny. You know? those little stack-able ones. The ones that are full when you only have 2 towels and a couple of shirts. These ones. We store our detergent and other laundry items on top of the machines. It’s not ideal for a shortly like me, but closet space is precious. Well the other day, Geroge was out, so I spent a few hours washing little loads and watching girly T V (the wife life). I threw a load onto the dryer on my way out to a good friends house for dinner. 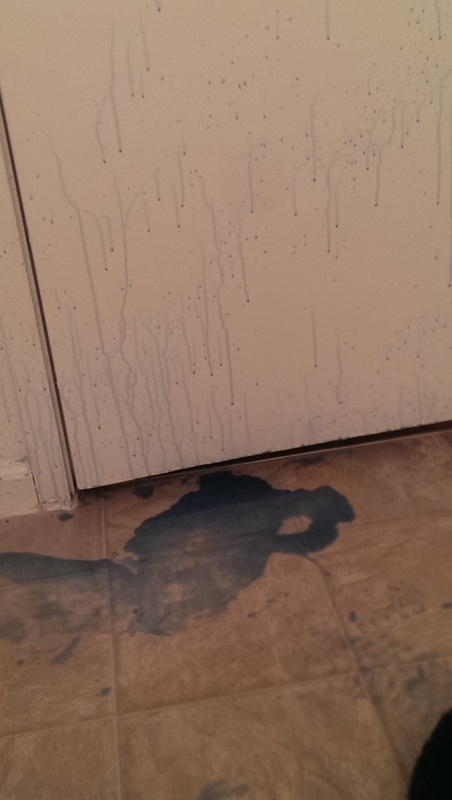 On my way back into the apartment I bee line for the bathroom, open the door and SPLAT. I step in to a big sticky puddle of fresh smelling detergent. I guess the dryer got a little unbalanced and shook the detergent off the top, and onto the floor. Just enough force to crack the lid and EXPLODE all over! 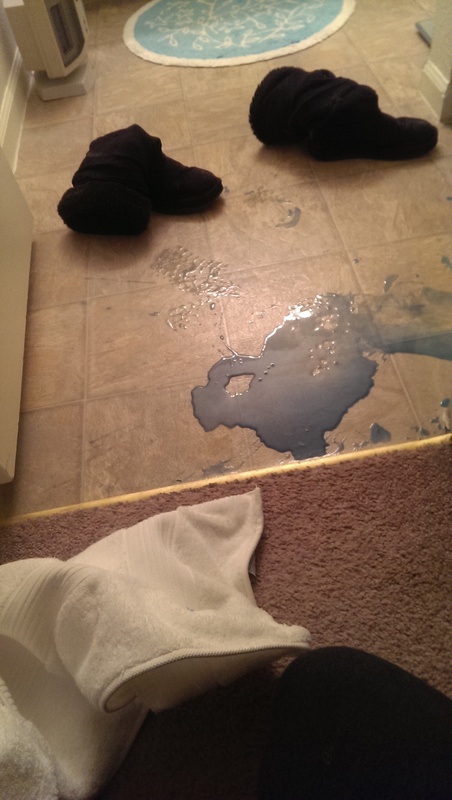 It looked like someone had murdered a blue alien in my bathroom. Slimy blue splatters covered the wall and door…and now my shoes. My bathroom decided had decided it wanted a good scrub. And scrub I did. Luckily I still had dirty clothes left, and could wipe up the mess with some towels and just toss them in. Even after the mess was up, it still seemed a bit sticky, so I got a rag wet and went over it again. 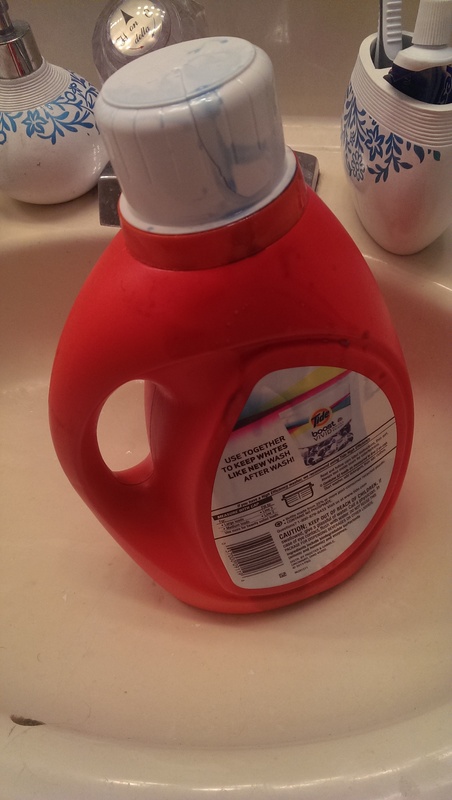 Just incase you aren’t aware, detergent makes a lot of bubbles. Interrupting this wedding series for a quick real life update. 😉 I have been having so much fun writing about all the details of 1/4/14, but I’ve really been missing writing about my life right now. Lately, my drive for blogging has been a little low and I think it may be time to move on to real life. 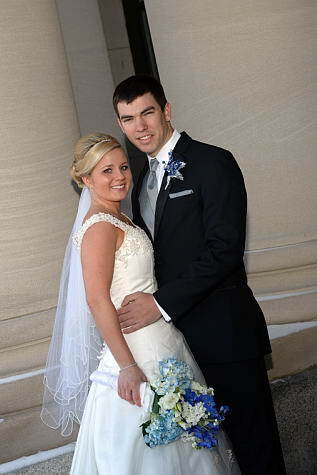 I expect a few more wedding posts in the future. Think less schedule…like little surprises when I am having post wedding blues. Marriage has been an adventure, responsibilities at work have increased, I’ve been cooking more than ever (now that I have someone to help me eat it :), and we have been trying to enjoy the little previews of spring as they come. So might as well get into it! 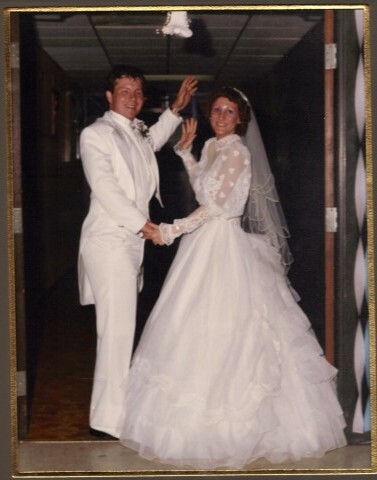 George and I went to our wedding together since our own. 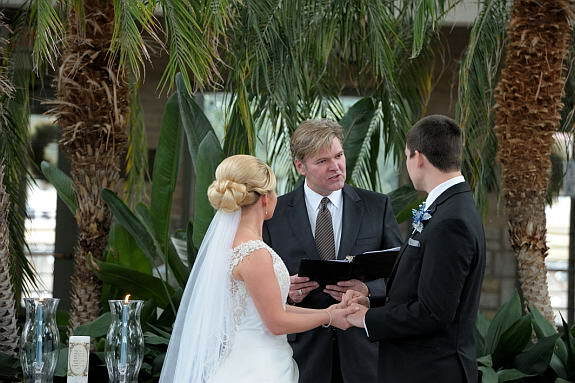 I have an entirely new appreciation for weddings now that I have planned one. I couldn’t help but take notice of all the beautiful little details. 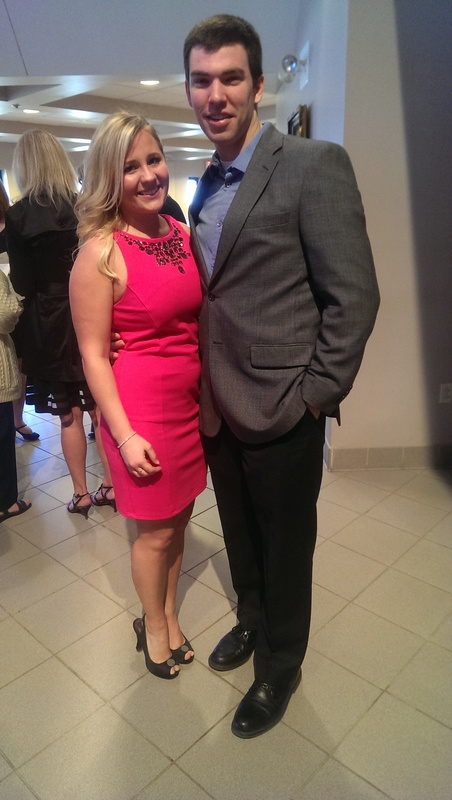 We were so thankful to be invited to celebrate with Kristen and Tyson and their families. Such a lovely event! I got a good workout on the dance floor with my main lady Banoo. 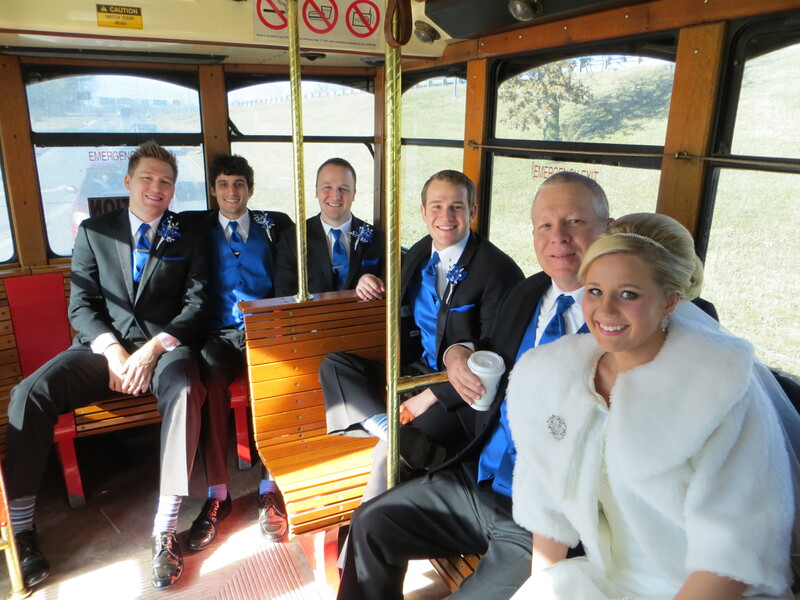 Of course I forgot to take pictures at the reception but I snapped a few of the crew after the ceremony. You know you had a good night out when you wake up with a black eye…or two of them. Yes, its true. I caught an elbow to the face on the dance floor, not to name names coughnathancough. It didn’t seem to hurt to bad at the time. The pain must have been masked by the music, smiles, and maybe a little wine. Sure enough waking up in the morning both eyes were a little black and blue…nothing a little makeup couldn’t cover for the day. Two days later I’m practically back to new. Also notice my shoes 😦 The little silk flower/bows fell off. Boo hoo…. Know what that means? Mom, it’s time to come to KC for a shopping weekend. 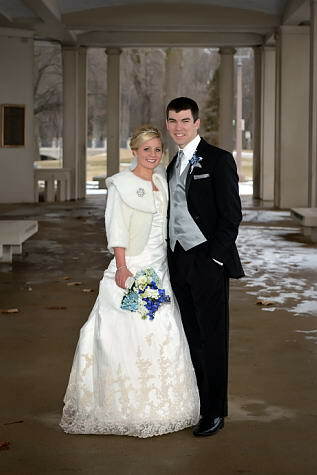 Yesterday I went over the something old, something new that I wore on my wedding. Today I have the borrowed and blue…and homemade! 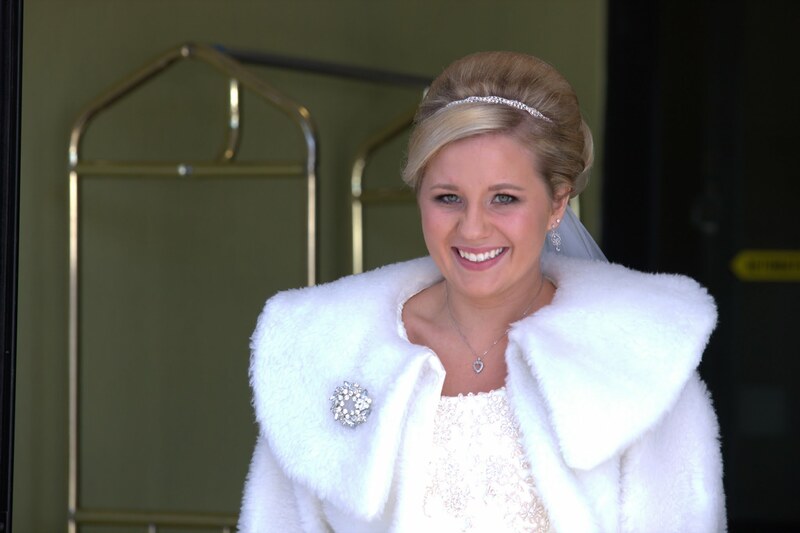 My borrowed item was the necklace I wore. It was from my mom’s jewelry box. I had tried on and bought a lot of necklaces, but when I brought them home and tried them on with the dress they just didn’t go well. With the neckline of the dress and the beading and detailing I needed something simple. This little heart necklace was perfect. 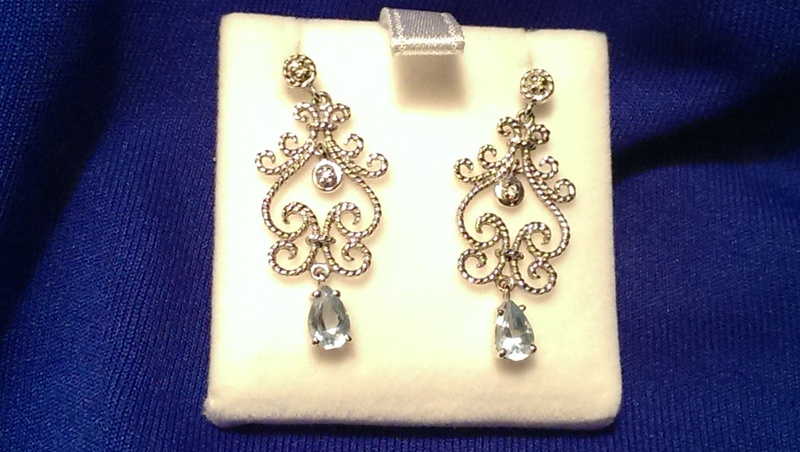 My blue were these beautiful earrings. I found them in Johannesburg South Africa when I went on my trip this past summer. 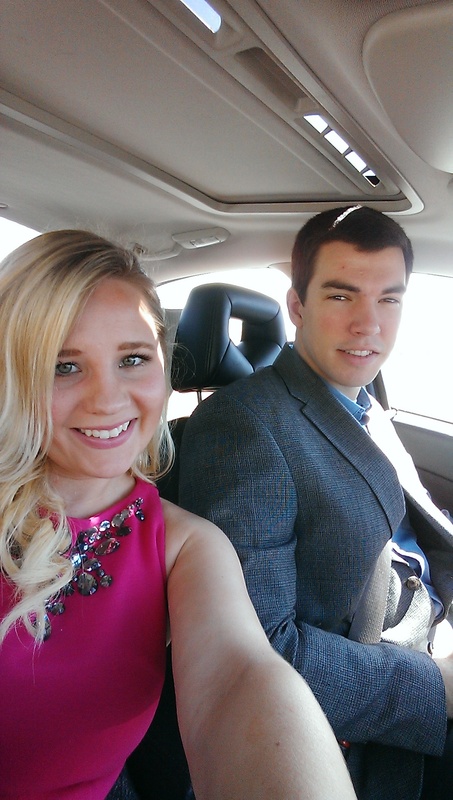 We had just set a wedding date before leaving for the trip. 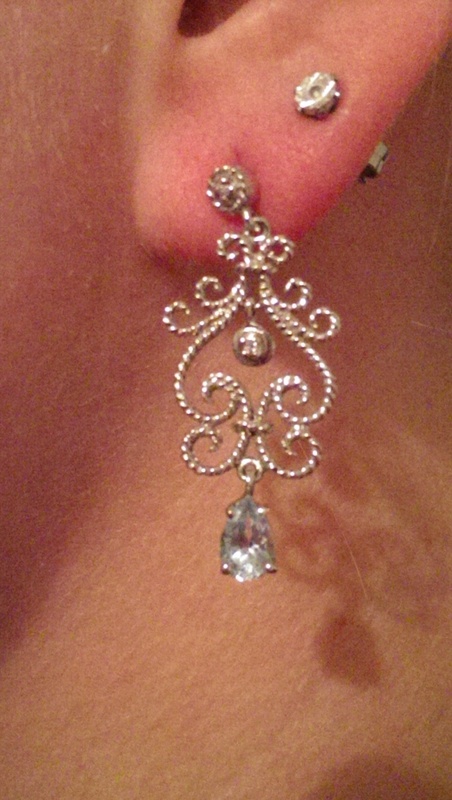 When I saw these earrings I just couldn’t pass them up. George funded them for my birthday present 😉 I loved the style and the shine and it was great to have gotten them in a place that made such an impact on me. 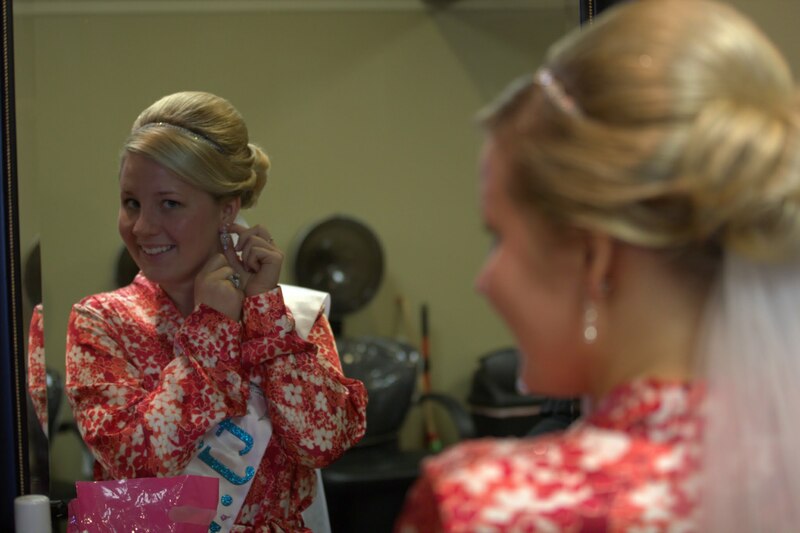 These earrings are really special to because forever they will remind me of South Africa, my wedding, and my husband. Okay you caught me… I know homemade is not part of the rhyme, but sometimes you just gotta take things into your own hands. 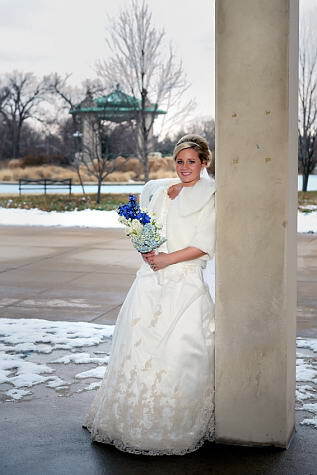 Since our wedding was January 4th I knew I would need some type of coat or shawl to keep me warm going from place to place. 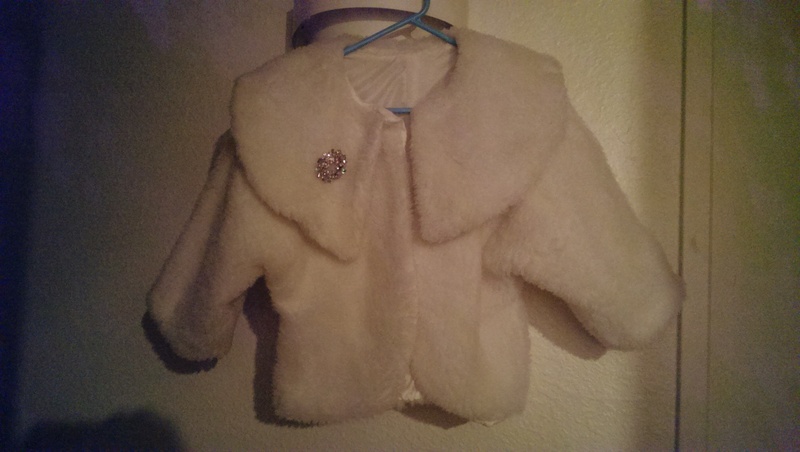 I began looking for a white fur coat around Christmas but just couldn’t find what I was looking for. A few things were close but REALLY expensive, and I just couldn’t see myself spending a ton on something I would probably only wear once or twice. I had a free Saturday in January and Banoo and I went to EVERY store in the Zona Rosa. I mean every store, even Justice! Finally we gave up and decided to take a risk and head to the fabric store with the help of the fabric store lady we headed back to my apartment with a bag of fur and a pattern. After wrestling with a pattern for the first time, some internet searches, and a helpful friend, I ended up with this! 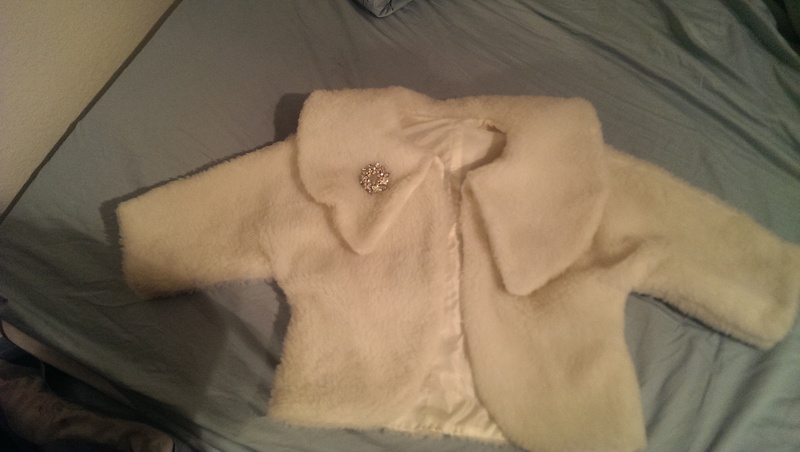 My homemade fur coat! This was the very first time I used a pattern, and I thought it turned out really well. It was exactly what I had envisioned. How cool is it that sewing our own clothes can reduce any limitations. If you can’t buy it, make it! Plus with a coupon and a sale, this beauty only cost me $20! 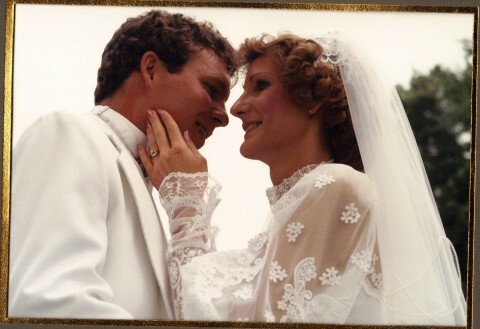 I wore the same veil that my mom wore when she married my dad 27 years ago. 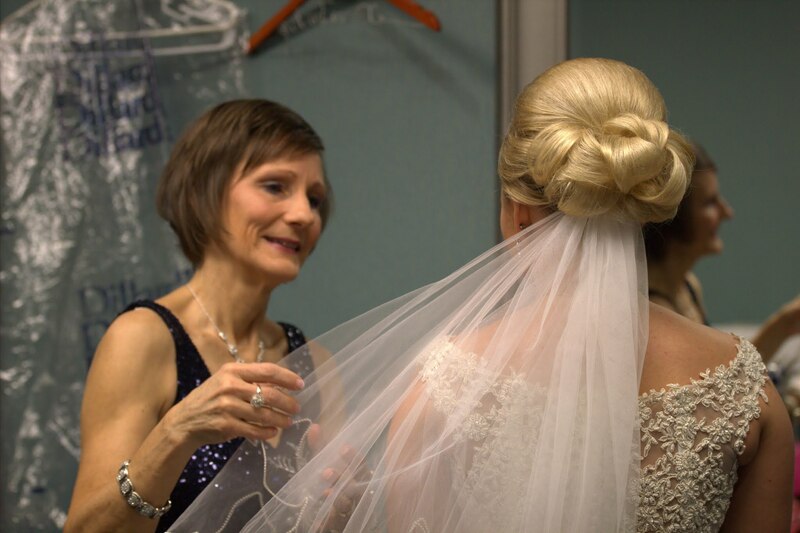 Before we went dress shopping, my mom, sister and I all tried on my mom’s dress and veil. 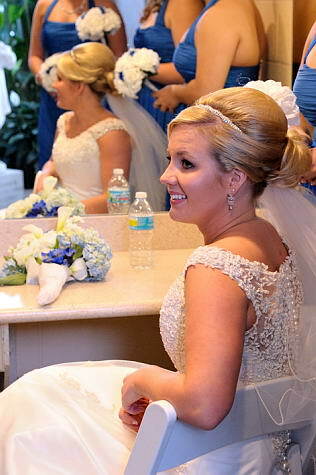 The veil was attached to a huge head piece. My mom pulled it out of the bag and said something along the lines of “This is hideous, I must let someone borrow my veil and they sewed it on to this ugly thing. 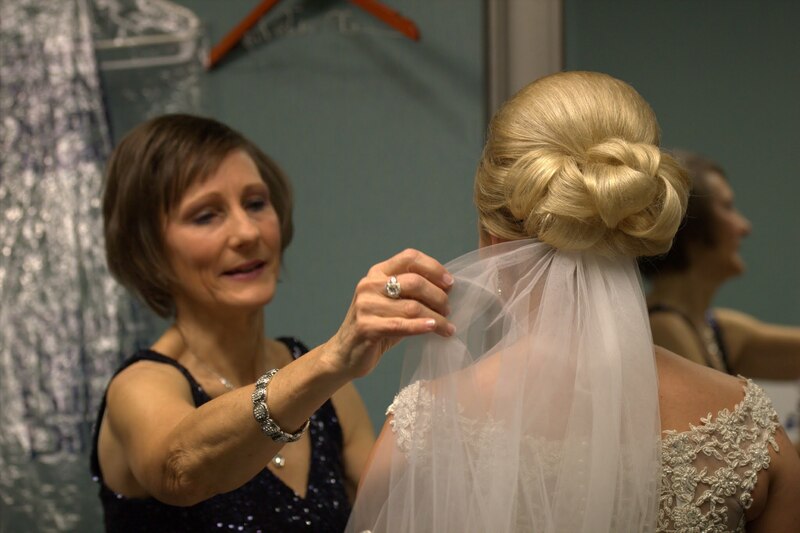 ” Well we looked back at the photos, and it was the same head piece my mom wore, but her hair covered most of it. Whoops! Her style has changed since then. But it was in great condition and I loved the length and little pearls along the bottom. 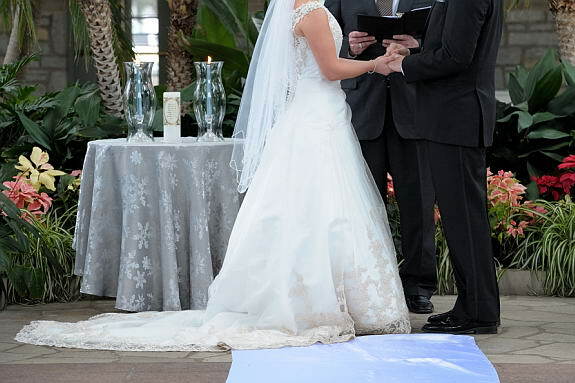 It ended up matching the color of the vintage lace on my dress perfectly. Needless to say, I removed it from the head piece and sewed it on to a clip. 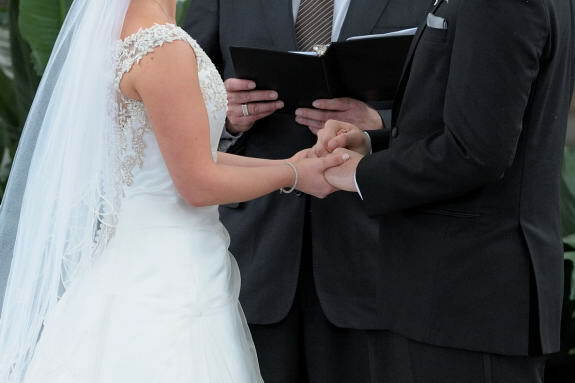 I loved having this special connection to my parents wedding on my wedding day. I absolutely love my something new! 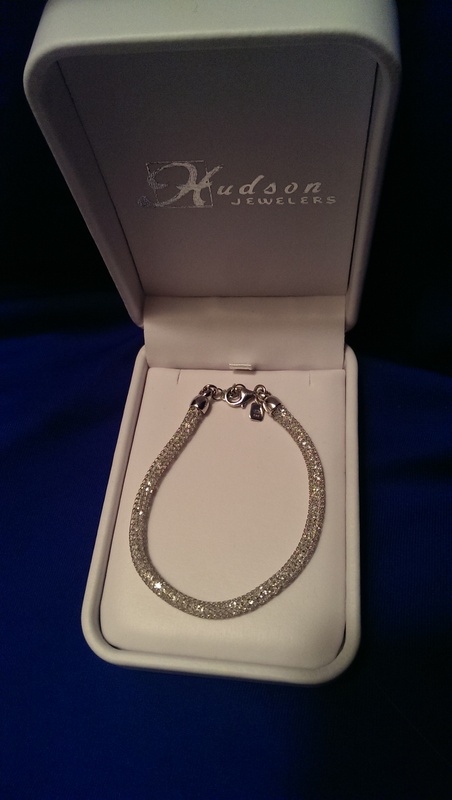 This beautiful bracelet was a gift from my Godmother Aunt Ann. 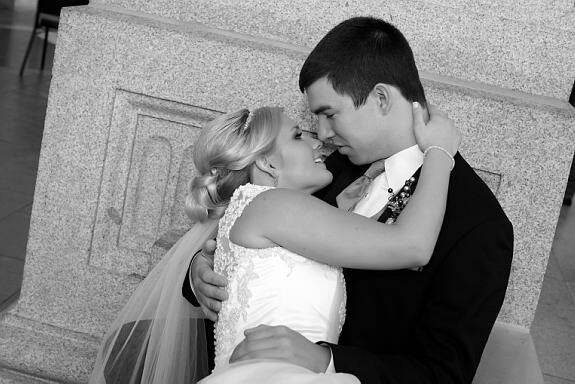 I was the Jr. Bride in her wedding when I was just three and it was special to have her read scripture at my wedding. 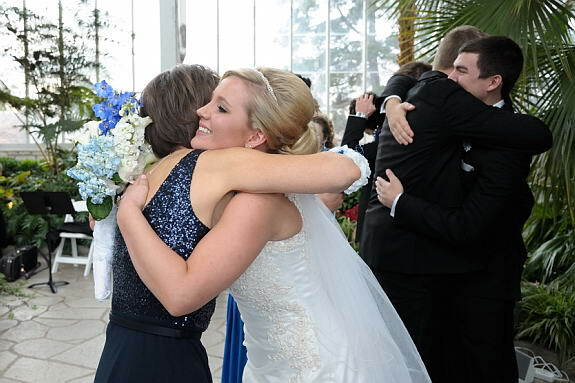 She gave the bracelet to me before the rehearsal dinner and I was so excited. She picked out the most gorgeous bracelet ever! It is so my style and went well with the dress. 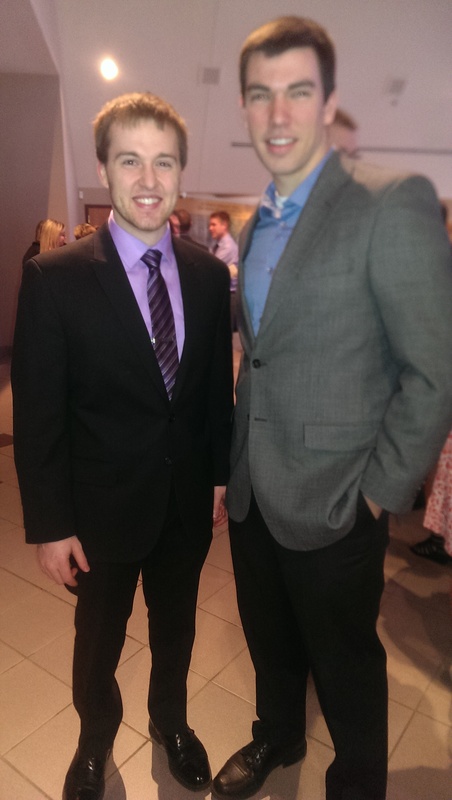 Someone told me before the ceremony to make sure it was on my right hand so it would be in the photos. I don’t remember who said that, but thank you! 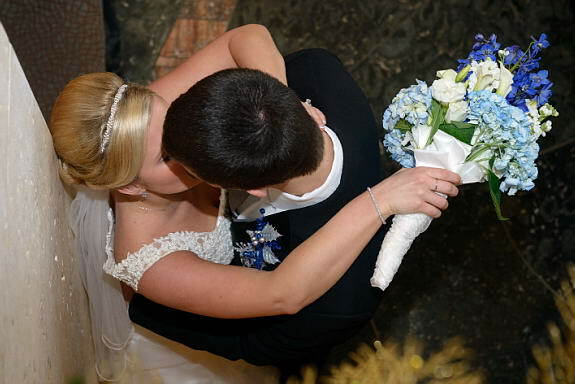 I love these photos of the bracelet while we are holding hands. Such a special gift! Thank you Aunt Ann! 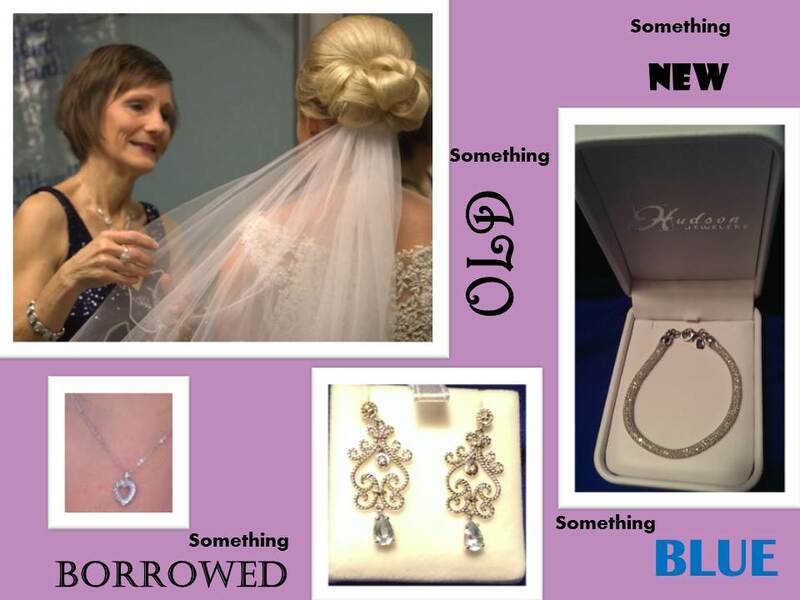 Click here for “Something Borrowed and Something Blue”. 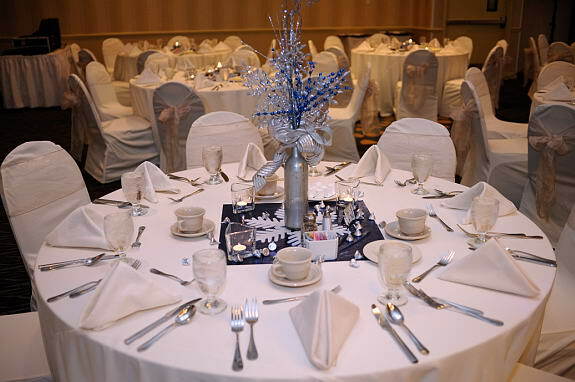 Here are the centerpieces I decided on for the tables at the reception. I think they turned out beautifully! 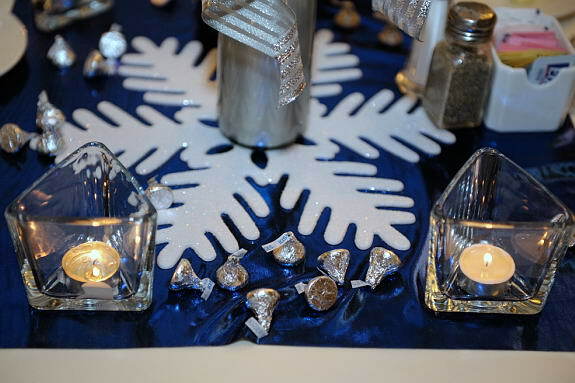 My colors were blue and silver, my idea of a perfect winter wonderland meets new years eve. I wanted the room to give off a fun and sparkly wintery vibe. I also am not huge into details. I didn’t want anything too complicated since I spent half the planning period in a totally different city. I didn’t want to have to move a ton of stuff across the state, or have a lot to do right before the big day. The less stress the better! 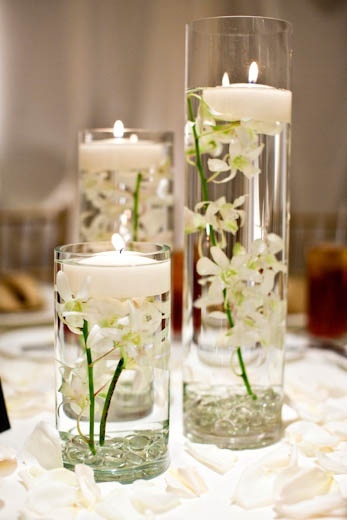 I found some great submerged flower ideas on Pinterest and thought it was a very pretty and simple look. 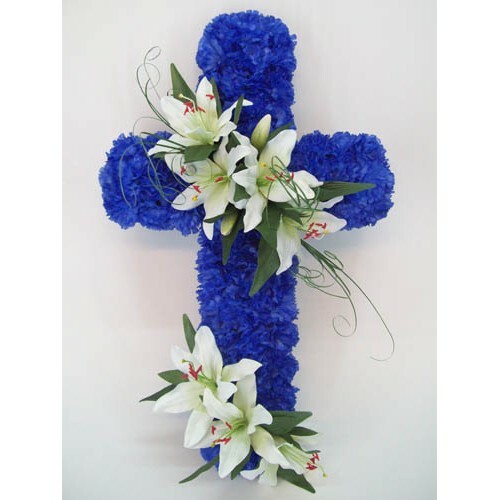 The water and candles created for a beautiful glow and shine, and was still able to incorporate the blue color in the flower. We made a few modifications and ended up with…. To make these I used my hot glue gun to attach a silk flower to a river rock/marble bead. The flower actually stayed down fine on its own but I figured just to be sure a little weight wouldn’t hurt. 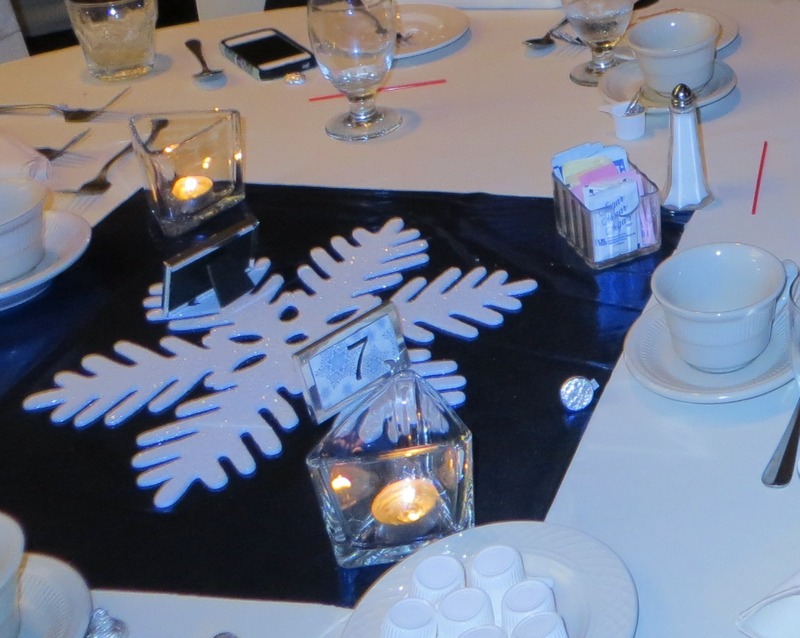 Both centerpieces were placed on a large snow flake and a blue square of fabric. I choose a lame` fabric because I loved the color and shine to it. 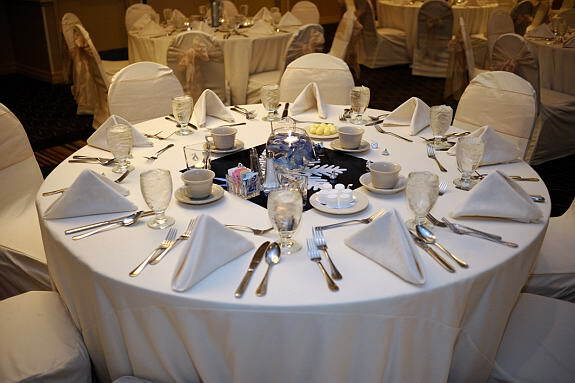 I used this fabric instead of a runner to tie the color into each table. 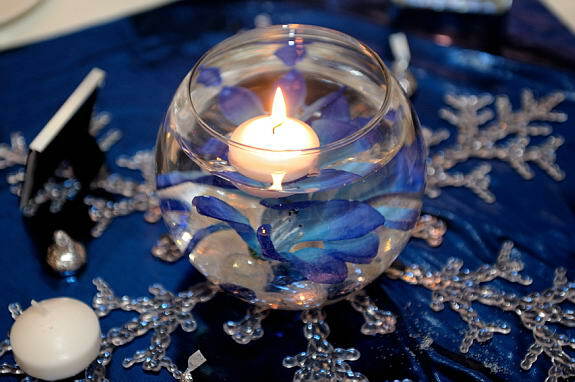 The reception venue provided 3 votive candles per table, that we set on the fabric around each centerpiece. 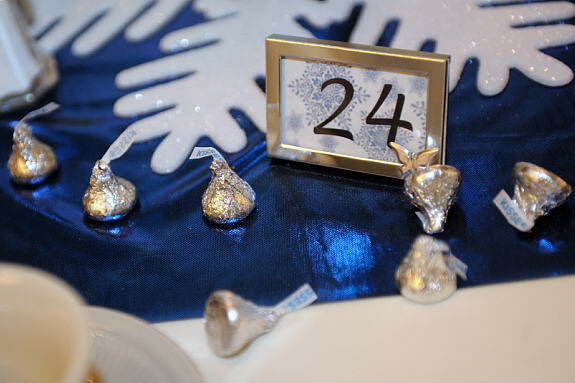 Then we sprinkled sliver kisses over the table for a little extra sparkle! 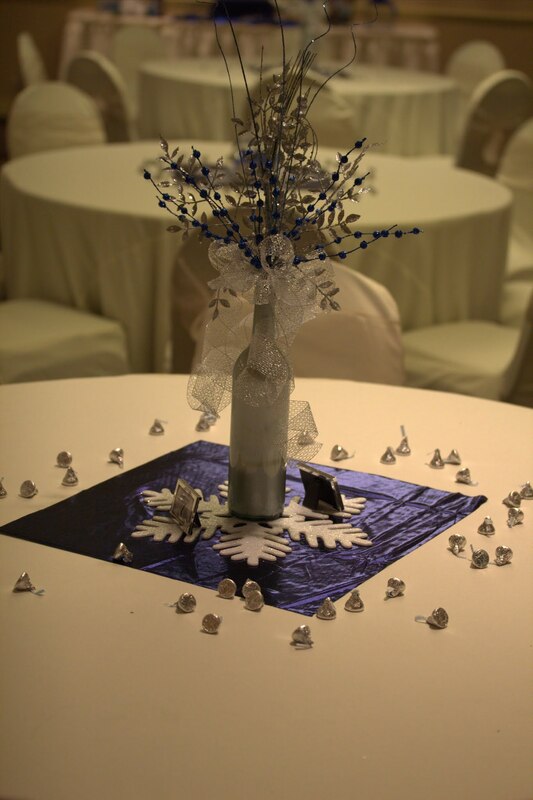 The other centerpiece was originally going to be a white tree with snow flakes and icicles hanging down. One of my amazingly creative relatives came up with this idea and I loved it. 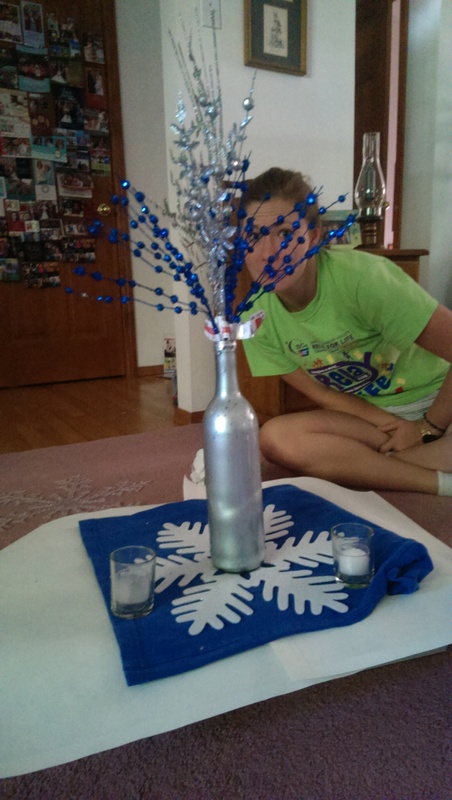 We decided to use wine bottles as a base because it seemed to be very sturdy for that specific tree branch. 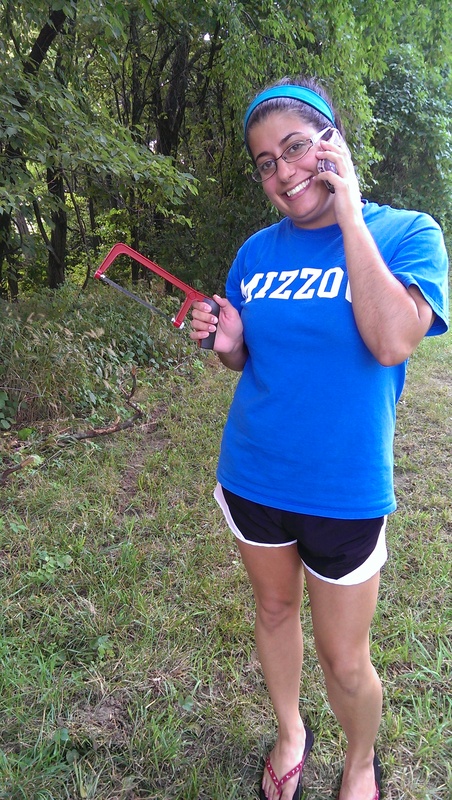 Banoo came over on a bridesmaid call, and went into the woods hunting for perfect tree branches. It turned into a much harder task than I thought. We ended up with a bunch of unstable braches, and tons of bug bites. 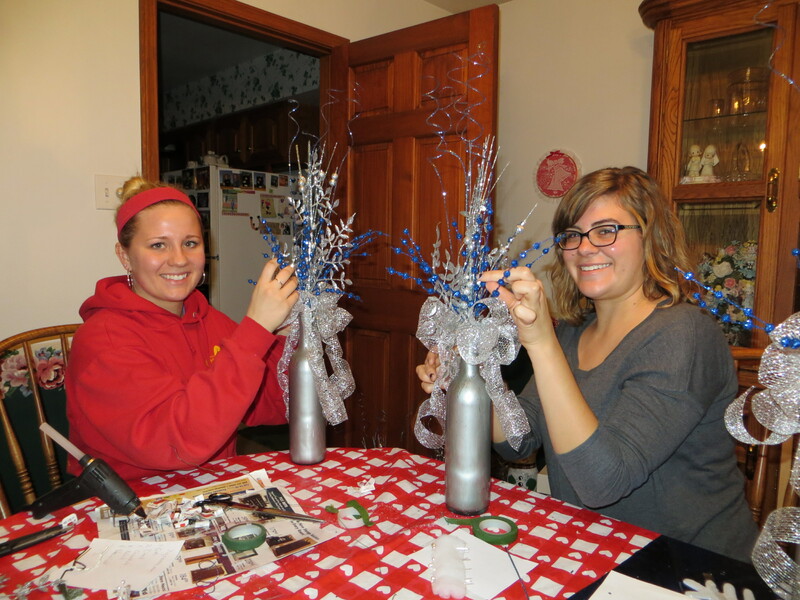 We put the branches on hold as she helped me get the labels off the wine bottles. Here is how we got the labels off. It was a breeze! Filled a cooler with hot water. You could also use a large tub, but I liked that the cooler kept the water hot for longer allowing the magic to work. We then filled the bottle with water (so they would stay submerged) and put them in the cooler. I added a squeeze of dish soap, and about a quarter cup of baking soda. We let it sit for about 30mins-1 hour. When we came back we could easily peel the labels off. Some that were more stubborn, came of easily once we rubbed them with a rag or our hands under the warm water. Most of them were easy, but even the stubborn ones were perfectly label free in the end. Painting the bottles proved to be the harder part. (Shout out to Banoo, Nathan, Dad, and Will for the help!) I used a silver metallic paint bought at home depot. 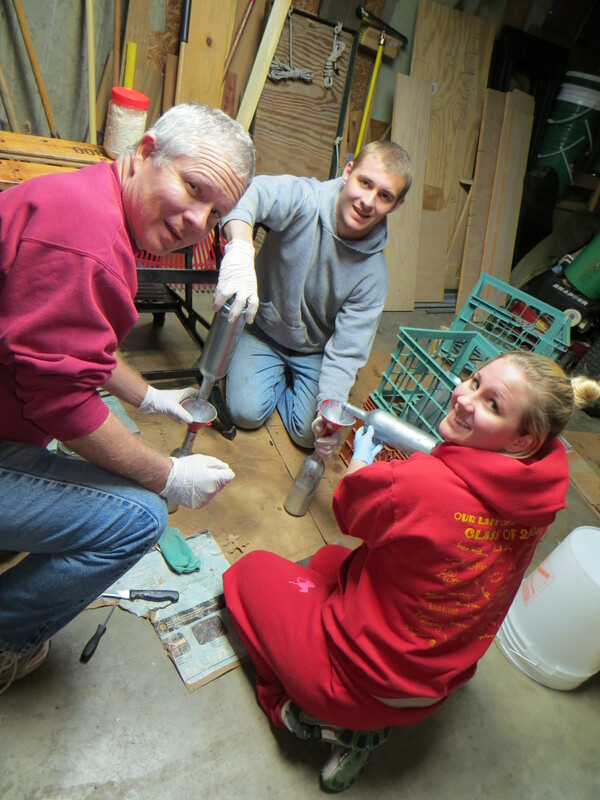 We used a funnel to pour the paint into the bottles, swirled it around and dumped it out. I read about this being a super easy process, but I think the paint we used gave us a little bit of trouble. It didn’t stick to the glass very well, and took DAYS to dry. We also had to do a few coats because as it slowly dried, it also dripped down leaving some spots near the neck uncovered. 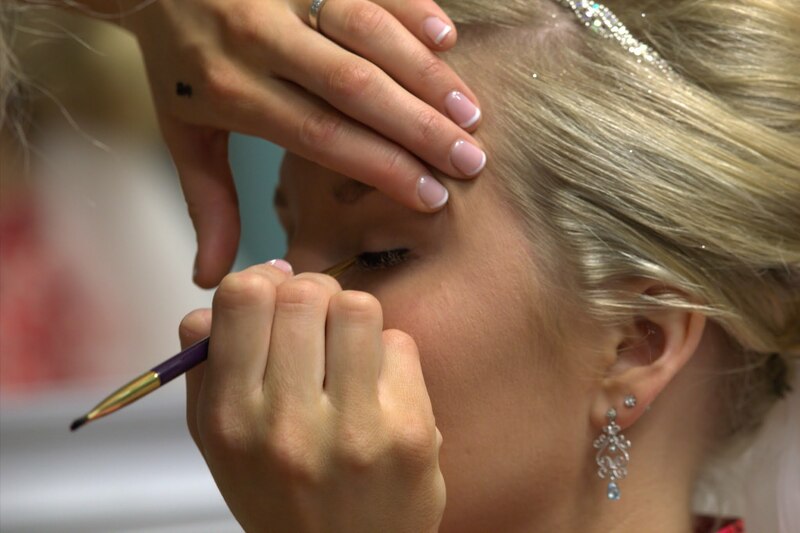 The final look gave it a bit of a mercury glass feel. It wasn’t what I originally had in mind, but really like how they tuned out! Enough said. Am I ashamed? No. 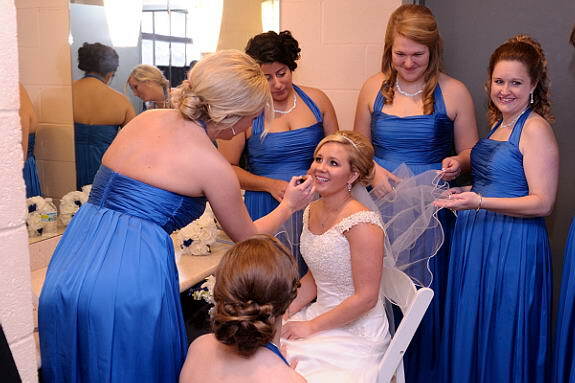 A bride on a budget has got to do what a brides go to do. Here is my sister with the mocked up prototype in September. Here are some more of the final product. 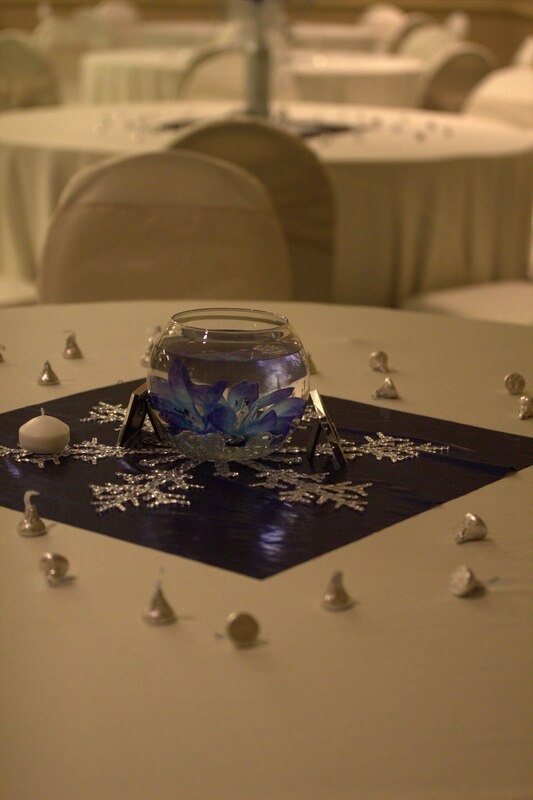 We still have the centerpieces if any bride-to-bes (or anyone planning an event ) wants to buy or borrow any of the items please don’t hesitate to comment or email me! (Whitnj@gmail.com). I’d love to share!